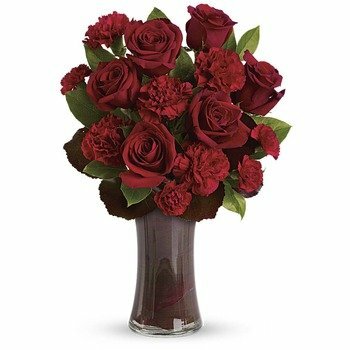 Turn up the heat with this fresh, artistic take on the classic red bouquet featuring roses, carnations, and an interesting mix of colorful leaves that leaves nothing to be desired. * Excellent, quick and pleasing services, whenever question I had, always got a right answer as an immediate adjustment if some trouble occurred. * Very good service, thank you. * I have always found 1st in Flowers reliable. On one occasion, when the flowers received were not consistent with what I had ordered, another floral arrangement was sent to the recipient. Excellent service!